The first Luftbrückendenkmal or ‘Denkmal für die Opfer der Luftbrücke’ (‘Berlin Airlift Monument’ or ‘Monument for the Victims of the Airlift’) at Platz der Luftbrücke located next to the entrance of the former ‘Flughafen Berlin-Tempelhof’ (Berlin Tempelhof Airport). 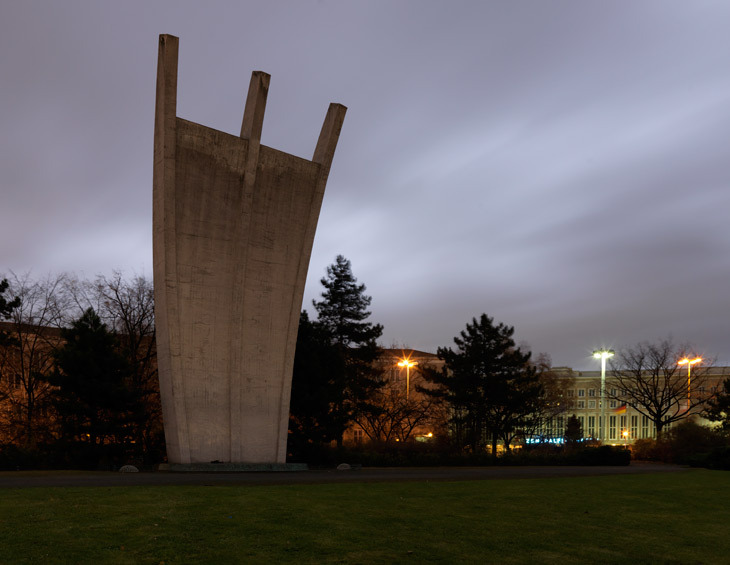 The monument was designed by the German architect Eduard Ludwig and raised i 1951. The airlift of Berlin across the Soviet-occupied zone of Germany began on 26 June 1948 and the last transport touched down at Tempelhof Airport on 30 September 1949.